Trees are so beautiful! We truly need them, but they also need us. Total tree care from Lawn Care Academy will show you how to easily care for your landscape trees and shrubs. 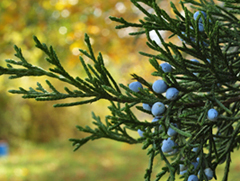 Click on the links at the bottom of this page for specific tree care information pages. Plants are necessary for life on earth for every oxygen-breathing creature. They come in all sizes and shapes, from the gorgeous Japanese maples to the magnificent live oaks. They are an important part of life. They produce oxygen, absorb harmful gases, provide shelter, and are a renewable resource. Simply saying that trees add value overlooks the many other wonderful attributes they bring to a landscape. But life for trees is not always rosy. Trees occasionally have problems. Hidden within the beauty of these woody plants lies a host of potential problems. Tree insects and tree diseases of all sorts can attack trees from the leaves down to the roots. Tree health, in part, is dependent on how careful you are with them. 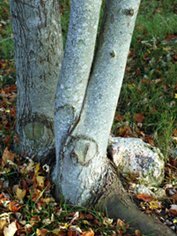 Many tree problems are caused by us through improper pruning cuts or even damage from large equipment, mowers, and weed trimming equipment. These wounds heal slowly and can allow disease pathogens to enter into the tree. Home landscape trees grow differently than forest trees. In forests, the strong survive and the weak die back naturally. In forests, trees usually form a single main truck and branches grow higher on the trunk where light is better. This is not always so with home landscapes. Trees growing in open landscapes, such as home lawns, often have more room to expand resulting in huge canopies that need to be maintained. Branches may form on the trunk all the way to the ground. Landscape trees often produce codominate stems instead of a single truck. Codominate stems often lead to structure failure years later as the tree matures. Young trees need to be pruned to ensure sound structure as they grow. Shrubs can be shaped to fit their environment and setting. Choosing the right tree pruning tools will save you time and money. Our "total tree care" will help you in all aspects of caring for your plants. Landscape trees will be expected to survive in whatever conditions we plant them in. However, trees should be planted in proper soil. We need to water them, if necessary, so they don’t become stressed. We need to match the tree to the climate zone we live in. We need to be aware that some insects are "tree specific" and will feed and breed on one specific type of tree, wherever it is found. Others insects are not so particular. Total tree care will teach you the basics. 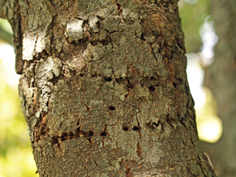 One of the biggest enemies of home landscape trees are insects and diseases. Bark beetles, for example, are capable of killing millions of forest trees in a single year. They make no distinction between a tree growing deep in a forest and the trees planted on your own property. While treating an entire forest in not practical, preventing insect damage to your landscape trees is. Prevention is worth a pound of cure. I remember losing all of my scotch pines in one year. By the time I noticed the damage it was too late. A little bit of prevention on my part could have spared then any damage. I don't take any chance now. To remain healthy, non-fruit bearing trees that are prone to insect damage can be sprayed or "injected" once a year with a systemic insecticide that will control the insects that feed on leaves and branches. Homeowners have access to many terrific products to make the job easier. Fruit trees will need to be pruned to produce the correct shape and to ensure maximum fruit yield. Not necessarily more fruit, but better or larger fruit. The system known as "Degree Days" can be used to help determine when damaging insects will emerge. Understanding problems associated with certain fruit trees and diagnosing symptoms is essential to maintaining a good crop. The following pages are designed to give the homeowner and professional the knowledge to easily care for their landscape plants. Through Lawn Care Academy's total tree care section you will learn how to feed and prune your trees. Learn the insects that are most likely to damage your plants and how to stop them. You can also see the signs of diseases and what to do about them. So, grab a cup of coffee and get comfortable and take a look through our total tree care tips. As always, thanks for looking. Our tree section is a brand new addition to Lawn Care Academy, so come back often to look at newly added pages. Pruning young trees for sound structure just got easier. Here is a pictorial guide loaded with facts on how to prune young shade trees, fruit trees, and many smaller upright trees. Yea, I know it is not rocket science, but there is a lot more to planting a tree correctly than digging a hole. This page covers everything you need to know from choosing the planting location to amending the backfill soil.